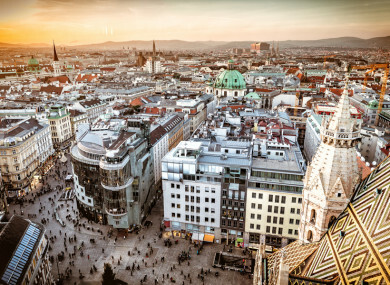 AUSTRIA’S CAPITAL VIENNA has beaten Melbourne to be ranked the “world’s most liveable city” in a new annual survey released today, ending the southern Australian city’s seven-year reign. At the other end of the spectrum, the five worst cities to live in were Damascus at the bottom of the table followed by Dhaka, Lagos, Karachi and Port Moresby in Papua New Guinea. The survey also looked at cities where long-term improvements had been made. Abidjan, Hanoi, Belgrade and Tehran saw the largest improvements in liveability over the last five years – more than five percentage points. Ukraine’s Kiev, the capital of a European country wracked by political violence, civil war and the loss of Crimea to Russia, saw the largest drop in its liveability over the last five years (-12.6%). Puerto Rico’s San Juan – which was devastated by a hurricane last year – as well as Damascus and Caracas also saw steep drops over the same period. Email “Vienna topples Melbourne in 'most liveable city' ranking”. Feedback on “Vienna topples Melbourne in 'most liveable city' ranking”.